Christa Boren, LPN, has a blast every summer working as a camp nurse at J.D. McCarty Center in Norman. It’s early afternoon in the hot, Oklahoma sunshine and Christa Boren, LPN, pulls back on the slingshot straps and lets a water balloon fly. 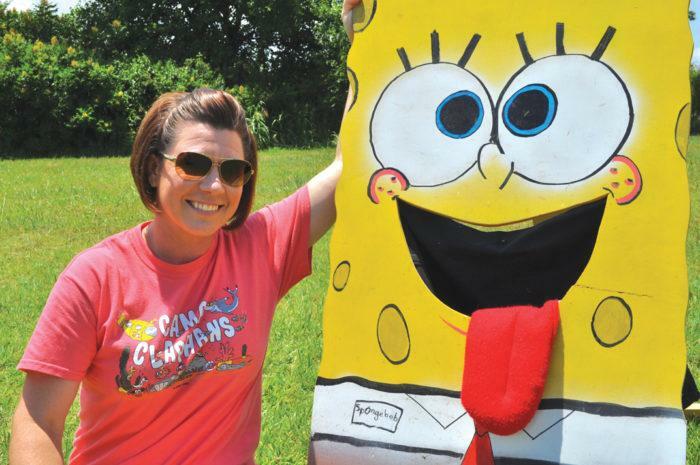 The wooden SpongeBob target 20-feet away survives a dousing as the balloon splashes to the ground. Boren worked at J.D. McCarty Center in Norman for a number of a years as a nurse and nurse manager. When family business moved her away she thought she’d never get to work at the center for children with developmental disabilities again. Boren has worked as the evening and night shift nurse at Camp ClapHans for three years now. Horseback riding, movie nights, talent shows and dance parties are just some of the events offered at camp ClapHans. Several members of the University of Oklahoma football team visited this summer as well as some church groups. Camp ClapHans is a residential summer camp for kids with special needs ages eight to 18. The camp is located on the south end of the McCarty Center’s 80-acre campus in Norman. It features two cabins, a multi-purpose building and is built next to an 11-acre lake. The camp features summer camp activities like archery, canoeing, fishing, horseback riding, camp fires, swimming, indoor and outdoor games, arts and crafts and much more. J.D. McCarty provides a one-to-one camper-to-staff ratio with a nurse on site 24-hours a day. That’s where Boren comes in. When her husband opened a physical therapy clinic in Elk City Boren quit her job at J.D. McCarty and moved with her family. Boren became a nurse at 20 and had worked in the hospital setting before settling into her role with J.D. McCarty. “It’s absolutely amazing. I loved the fast-paced stuff but at times it does get a little overwhelming. In the acute-care settings in the hospitals you have to deal with all the sad stuff – giving people cancer diagnosis and all that stuff that comes with nursing,” Boren said. “Here at camp we don’t have that at all. These kids love to be here. It’s so laid-back and we get to really enjoy the kids and try to make their time here as enjoyable as possible. When she’s not in camp, Boren still makes the drive from Elk City to Norman to take her six-year-old son for therapy at JD McCarty. Last school year, Boren was a teacher’s aide but admits most of her time is spent being the mom to three boys active in sports. The move to Elk City was a good but so has the opportunity to bring her child to treatment at J.D. McCarty. The J. D. McCarty Center was founded in 1946, by a veterans group called the 40 et 8 of Oklahoma. The 40 et 8 was an honor society within the American Legion. When the McCarty Center first opened its doors to patients it only treated one diagnosis – cerebral palsy. Today, the center has treated more than 100 different diagnoses in the developmental disability category. Kids come to Norman for treatment from all over the state of Oklahoma. Children referred to the hospital are evaluated and treated by a team of pediatricians, pediatric specialists, registered nurses and LPNs, direct care specialists, physical, occupational, speech and language therapists, a dietitian, a clinical psychologist and psychology clinicians and social workers who focus on getting a child to their highest level of functionality and independence. “Any kid who comes through the door becomes your kid,” Boren said.